Ticket Cameras on School Buses? 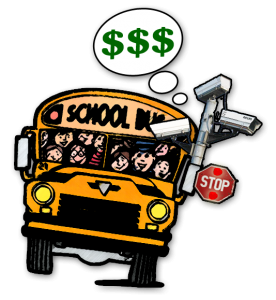 There is a new bill that has been introduced (SB 5540) that would give school districts (who always need money) the authorization to place cameras on school buses that would ticket vehicles that do not follow the law regarding school buses. any compensation paid to the vendor of the equipment may not be based upon infractions or revenue generated. Before entering into a contract, a school district is required to follow the competitive bid process to ensure the most beneficial contract to the school district. Any revenue collected from the infractions, less the cost to operate the program, must be used for school zone safety projects. If a driver does not pay an infraction resulting from a school bus safety camera, the driver cannot renew his or her license until it has been paid. The only difference (we have found) between this proposed bill and current law regarding red light & speed cameras is that if you don’t pay school bus tickets you won’t be able to renew your license until you do. School Bus ticket cameras are a solution in search of a problem. According to Alan Jones the director of the Office of Superintendent of Public Instruction (in the video below) out of 20,000,000,000 kids loading and unloading buses there are 8-10 deaths per year, nationwide! That’s a 1 in 2,000,000,000 chance that a child will be killed. Your chances of being killed by an insect bite (1 in 30,589,556) are higher than that! Neither one of those will bring in money for the schools, but they will increase safety. 20 billion kids? Rather 20 billion loadings and unloadings. Resulting number is about 1 in 5.5 million chance per child per year, compared with a one in 5.1 million chance of dying from a bee, hornet or wasp sting per year. A much better comparison. I hate statistics that are manipulated. Most people don't take time to analysis the numbers. Please present them in a clearer manner. This really pisses me off. First of all I could not give a rats behind about your statistics….one child killed or injured due to a moron is one child to many. I drive a bus and unfortunatly I get to see first hand what happens when idiots that they think they can "beat the system" almost hit kids. Is it worth it? If installing cameras to help prosecute morons, I say GO FOR IT!!! Have you been a bus driver? I doubt it. I have. I've been driving for almost a decade. Although you may disagree with this, I don't care, it's about time a state (and the federal government should) stepped up to the plate to curb this problem. @lebononite- Is there a huge safety issue when it comes to school buses? According to the National Highway Safety Commission, out of 30,797 traffic fatalities in 2009, 21 involved a school bus, 13 of which were caused by the bus driver slamming into pedestrians.